According to the U.S. Small Business Administration, small businesses are essentially the foundation of our communities. Over the last two decades, both small and new business have been creating two out of every three new jobs in the United States. Furthermore, over half of all working Americans today own or work for a small business. You’ve probably noticed a huge increase in support of small businesses. Even huge corporations like American Express are getting behind small businesses with their Shop Small campaign promoting Small Business Saturdays. *Side note: if you accept American Express at your business, be sure to get the free promotional materials that they offer! In today’s world, there is a growing concern for ethically sourced food, clothes, and products. People like to shop locally as there is more transparency in what they are buying and they feel good about supporting and strengthening the local economy. Become the local expert. Whether you own a pet boutique or a pastry shop, being an expert in your field is what builds trust in your community. By becoming the “go-to” person for a particular topic - whether it be tax advice or teaching guitar - people will be more likely to seek you out when they need help. In order to increase awareness, try new ways to reach out to your community. Offer to write a guest article for the neighborhood newspaper or magazine, contact the local radio show and see if you can land a guest spot, or post regularly in your neighborhood Facebook group. You will also want to participate in as many community events as possible, like Chamber of Commerce mixers and Saturday morning markets. If your community doesn’t have these sorts of events, you could even be the one to create them! Creating and marketing events that provide information and awareness about supporting small and local businesses will stimulate the local economy. Whether it’s a sidewalk sale or movies in the park, with enough effort and support, you can create a successful community event. Join your Chamber of Commerce. For a small fee, you can become a member of your local Chamber of Commerce. This will help you to create connections with other business owners in your area. Building these connections can provide you with the resources and tools to solve issues, and provide new ideas and insight. Should you find yourself in a tough situation (need professional advice? A/C went out? Need a last minute lunch order for your staff? ), you’ll already have established connections with local chamber members who will happily give you a hand. Becoming an active member of your community doesn’t just mean helping each other out, it also means you will be viewed more favorably in your community. A study conducted by The Shapiro Group and Market Street Services found that when consumers were aware that a small business was a Chamber of Commerce member, they were 44% more likely to think favorably of them and 66% more likely to purchase goods or services from that company. That’s huge! I recently attended a Chamber of Commerce event and a cupcake shop that just opened was providing samples of their delicious treats. I was hooked and am now a regular customer, and have provided plenty of referrals. Their actual location is tucked away in the very back of a shopping plaza; I would have never known they were there! By becoming active members of their community, they were able to win some new business. Be charitable. Part of being a good community member is supporting those less fortunate. This is most obviously done through donations, whether that’s money or items. Some choose to donate a percentage or profits or even services to benefit a non-profit organization. If money is tight, consider donating your time to a specific event or organize a community cleanup. You might want to start by focusing on a charity that is in line with your business focus. For example, a hardware store might support a charity that builds homes for those in need or a food market might donate to the local food pantry. Perhaps there was a local disaster, such as a fire. Hosting a fundraiser or shop-a-thon, where a portion of the proceeds go to the family in need, directly helps members of your community while also bettering your relationship with community members. One of our clients is a restaurant located on the beach. They host 4 annual beach clean-ups where they provide all the supplies (biodegradable trash bags, gloves, sunscreen, hand sanitizer, etc.). After the clean-up, all volunteers are invited to the restaurant for a complimentary breakfast buffet. Volunteers feel good for doing work in the community, the client feels good for being a part of something meaningful, and they show they are caring community members which encourages customers to choose them over other dining options. Helping others (and the environment) is truly a win-win for all. Sponsor Local Youth. Investing in today’s youth is investing in the future, and there are many ways you can do this. Local schools frequently seek out sponsorships, but you can also get creative with your services. Are you a restaurant? Reach out and see if you can sponsor a Teacher Appreciation luncheon. Are sports more in line with your interests? From Little League to Varsity, you can always count on kids playing sports. By sponsoring a local sports team, you are supporting young athletes and healthy lifestyles while getting the opportunity to have some big exposure. You could even take it a step further and create a scholarship fund for local students. You could set up a fund that supports students in pursuit of a career in your industry, like law or accounting or a trade. Even a small fund goes a long way when it comes to purchasing school supplies or paying tuition! Serve on a Community Board. This is a great way to get yourself out there in the community. Try to find one that suits your interest or reflects the meaning of your business. If you sell art supplies, you might want to try a Council for the Arts. If you’re located right in the heart of downtown, try the Downtown Business Council. If you’re passionate about education or provide services in the education field, try to serve on the local school board. These boards are often full of influential people in the community. These connections will allow you to serve your community while creating connections with those that will become your customers. Host Community Meetings. This might not work for everyone, but if you’ve got the space, let your local organizations know. From Kiwanis Club to the local civil action group, paying for meeting space can be a financial hardship for many local groups. Offering the space in your office or store can be a huge help. Not only will you support the betterment of the community, you’ll also establish positive relationships with the group’s members. When they need the goods or services your company offers, you will be at the top of their list. This is just the beginning of how you can get involved in the community as a local business owner. 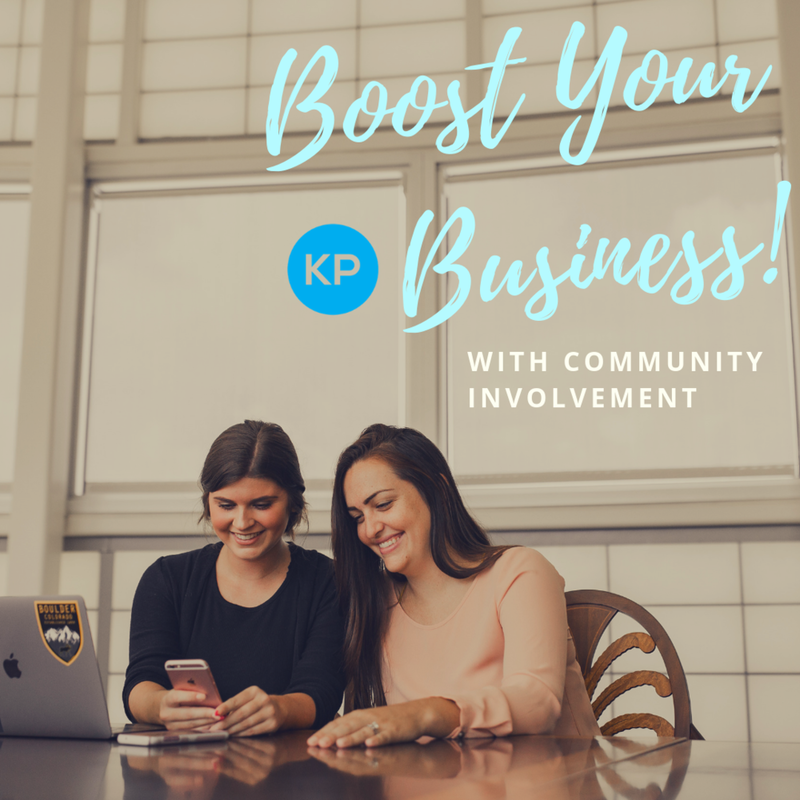 Though marketing can be stressful, and sometimes, putting yourself out there is scary, taking an active role in your community is a great way to do good, feel good, and get your business out there!